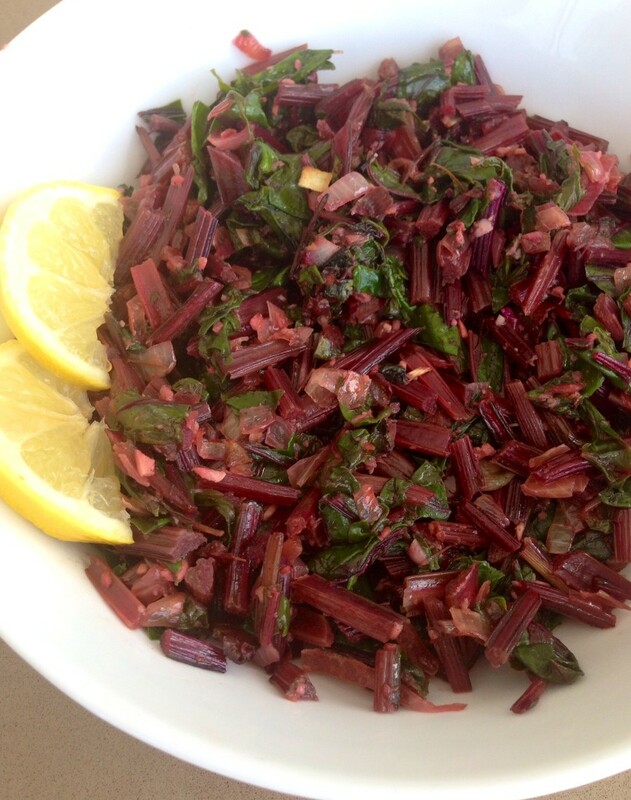 Beetroot leaves stir fry with lemon. YES…. The leaves, not the bulb. Most of us just discard the leaves however they are fully packed with nutrients even more so than the beetroot bulb itself. They are great for the liver as well as reducing cholesterol and much more. Pick a bunch that has young fresh leaves and cook within a couple of days because they tend to wilt if left for too long in the fridge,. The bulb lasts much longer. You can also chop the leaves and throw them in with your usual vegetable stir fry or chop and add to your vegetable soup. This recipe uses the whole bunch, it cooks in minutes, very easy and it can be served as a side dish or enjoyed with Lebanese bread on its own. Wash beetroot leaves and slice. Dice onion finely and put in pan with 1 table-spoon of oil and fry gently until onion is golden brown, add beetroot leaves and 1 extra tablespoon oil and toss and fry gently for a few minutes until the greens have wilted, add salt and pepper to taste, cover and leave it for another 2 minutes. Turn the heat off add the lemon juice and mix, serve warm. Tags: beetroot, food, glutenfree, lemon, salad, stir fry, vegan, vegetarian. Bookmark the permalink.